Printable formula sheets allowing you to dye the session using 4 different sizes of fabric (from fat eighths to full yards) using either metric or imperial measurements, your choice! In painting, a tint is achieved by adding white paint to any pure hue. With a bit of white an intense magenta becomes rose, add some more and it becomes pink. But painting is adding color that lays on the external surface of the substrate, be it wood, or canvas or fabric. 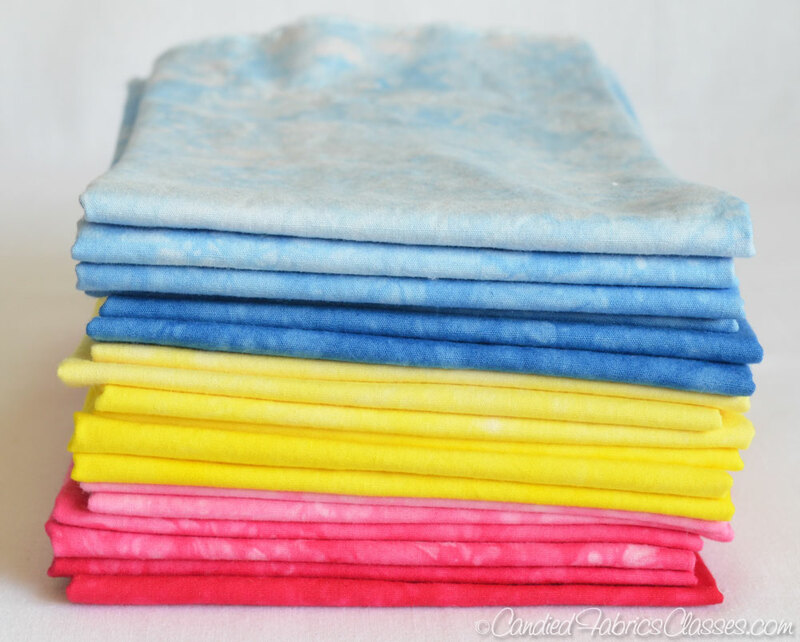 In dyeing, we are adding a dye that penetrates the fibers, and then (with the addition of Soda Ash) is permanently linked to the fiber through something called a covalent bond. Dyeing creates fabric that is colored all the way through, there is no “wrong side” of dyed fabric, and one of the reasons it is preferred by fabric artists who do fused appliqué with is that the cut edges are the same color as the rest of the piece, so there is no tiny flash of white around the edge. Because they lay upon the surface, paints can be layered, and one hue can cover a hue that is underneath. Dyeing is completely different: it binds to receptive sites in the cellulose fiber that our cotton fabric is made from and adds to the color of the fiber, but doesn’t cover it up. Thus, if you start with a fabric that isn’t white, you will have to take into account the color of the base fabric. If the fabric is a light off white (like unbleached muslin) its effect on the final color will in most cases be negligible. But you could never take red fabric and dye it blue, the blue that you added would add to the red and you would have purple. my preferred way to color cloth is the visual texture I can easily achieve. The way I accomplish this is called Low Water Immersion Dyeing (LWI). A traditional dyebath (called full immersion) has a high volume of colored liquid and the cloth must be kept moving through it during the dye process. When complete, the fabric will be one even color. 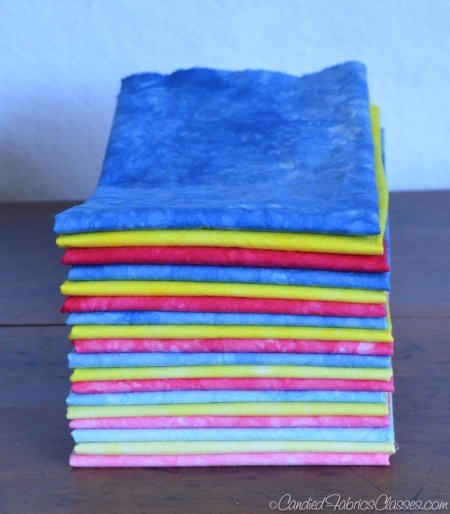 In LWI, the fabric is wet with just enough dye and soda ash solution and then physically manipulated in some way such that there are nooks, crannies and/or folds of all sorts for the dye particles to move in different ways before finally bonding to the fiber. What we’re left with is a glorious visual texture that is always unique, emphasizing the hand-made-ness of the fabric, and when used, helps the observer’s eye travel around the piece, which is usually a desired effect. 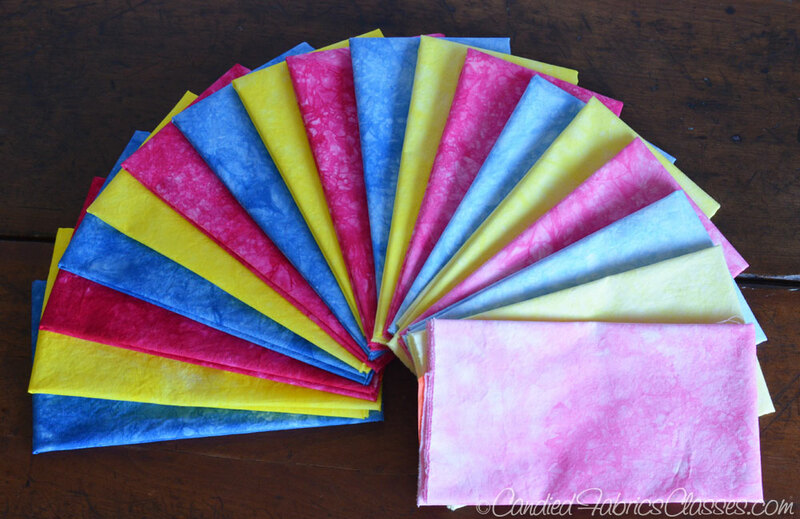 So when we want to make lighter, more pastel versions of a particular hue, we add water to the dye and then add it to our physically manipulated fabric. The less dye in the liquid, the more the white of the fabric can still be visible, thus the lighter the created tint. What’s all this fuss about pure dyes? When you take a look at any site selling Procion MX dyes, you will see a long list of colors. The vast majority of them are mixtures made from the “pure dyes” I keep referring to, and often times some sort of neutral filler so that there will be less color on the finished fiber. These mixes for the most part change over time, and are unique to each company. 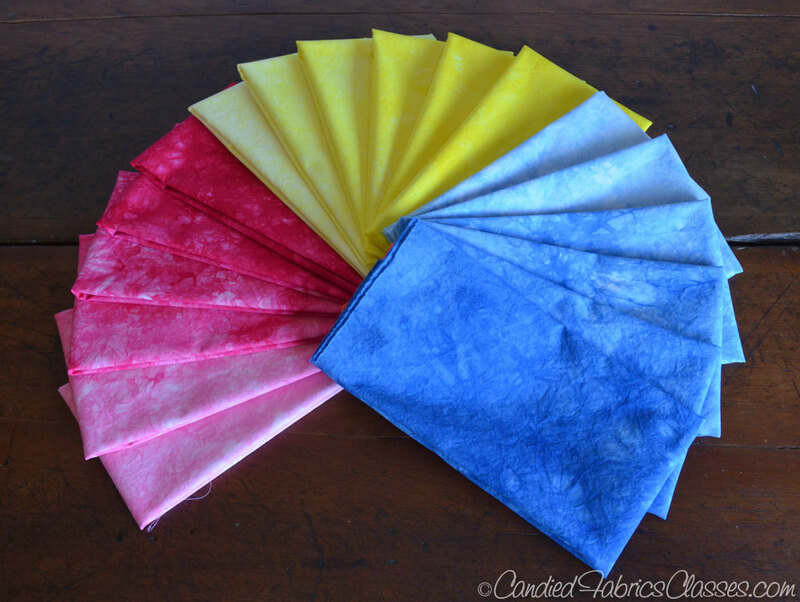 As you will see when you begin mixing dyes in session 3, combining 2 pure dyes that are primary colors gives you lots of clear, bright, secondary hues. 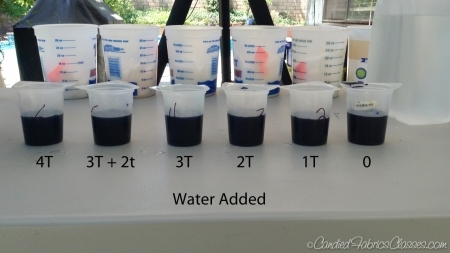 When you DON’T use pure dyes, you may inadvertently be adding colors that aren’t immediately apparent from the dye, but have an effect on the final color when you mix it with others. It has a confounding factor that is unnecessary. Plus, those filler they add so you can get lighter colors? Better to just use less dye! To summarize: Using pure dyes is simpler and cheaper. 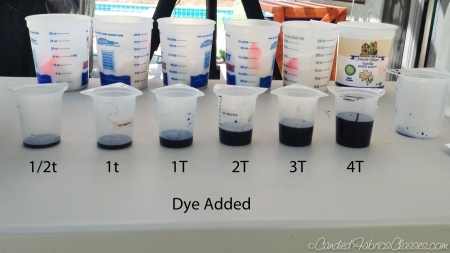 Dyestock of your 3 primary dyes, amounts given below for fat quarters, see the formula worksheets for the other amounts. I will also provide you with the measurements to do this with “fat eighths” if you’d like to use smaller amounts, and half & full yards as well, for those who want to really build their stash! 18 small-ish plastic containers (I used 3-cup/750 ml cheap generic “Tupperware” and recycled yogurt tubs) Gallon ziploc bags also work, but be careful of leaks. Procion MX is a very fine powder, and should not be allowed to come in contact with your skin or mucous membranes (especially your lungs). Prolonged exposure to the powder could cause your body to develop a severe allergic response to the dye, such that you could never use it again. As “prolonged exposure” is different for everyone, you have to minimize contact with the powder: Thus always wear a particulate filter mask and rubber or latex gloves when around the powder form of Procion MX and clean up any spills immediately! Common sense also tells us to wear old fabric you don’t mind getting dye on, just in case. Rip your fabric into fat quarters and label them, you’ll need 18 in all. 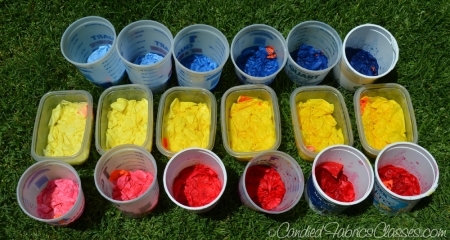 For this session I suggest using a letter for each dye + the number of each container. Once the fabric is fully saturated, wring them out and place them into individual small plastic containers. I like to “scrumble” the fabric – I create lots of nooks and crannies for the dye to settle in, this is how I get my awesome texture. See the pictures and video for a good example of what “scrumpling” is – what it is NOT as balling the fabric up in a ball – this creates large areas that remain undyed, something I don’t find very attractive. Place the fabric in a container that creates a tight fit. 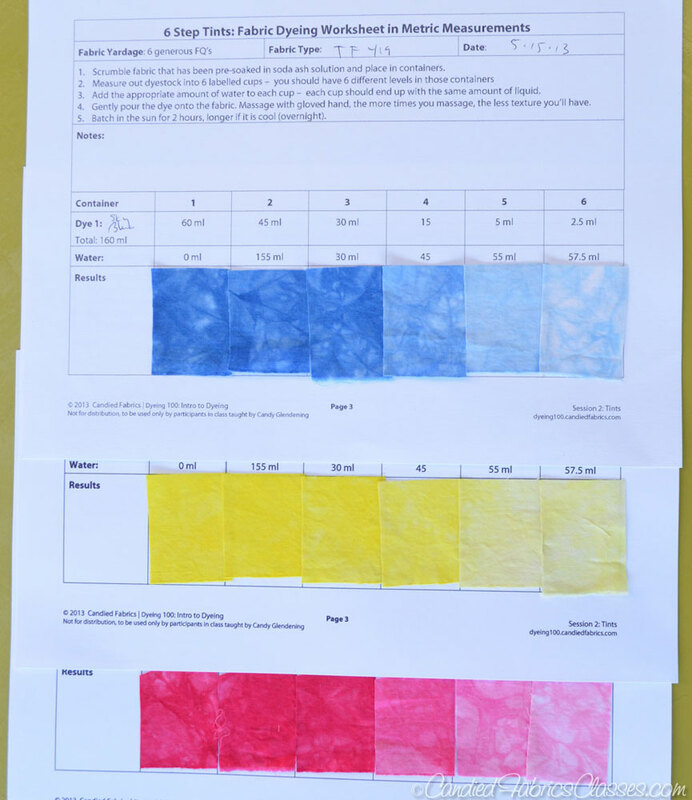 Wearing your gloves, distribute the dye according to the chart you print off from the “formula sheet” provided in the downloads section of this session. Now add the amount of water specified in the recipe sheet; note that the total volume in each cup should be 60 ml or ¼ cup. 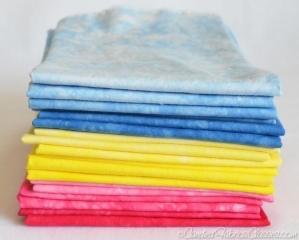 If you want less visual texture on your fabric, massage it every 10-15 min. for the next hour or so. The less you massage, the more texture you get – so I just give it a quick one at the beginning and that’s it! Leave the fabric to either sit in the sun or in a warm part of your house. After 2 hours, if the dyes were kept at a warm room temperature, ~95% of the dye will have reacted with the fiber. You can wash the fabric then, or wait. I usually wait overnight to eke out that last little bit of dyeing (if your room is cool, the reaction will take longer). You also can leave these until you have time; it is at your convenience. 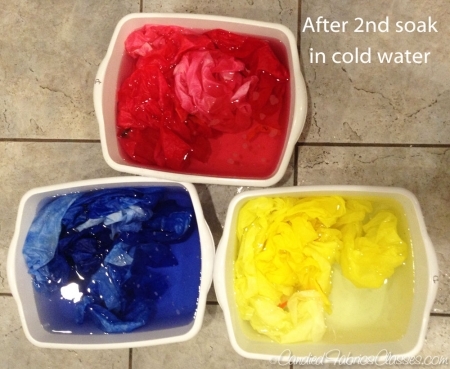 One primary color at a time, dump the fabric in your sink (be careful of splashes, the dye can still stain your counter top, your grout and your fabric!!!) Rinse in cool water til the fabric loses its slippery feel and loses very little color when squeezed. When the slipperiness is gone, so is most of the soda ash, so the odds of any dye reacting with other fiber now are remote. 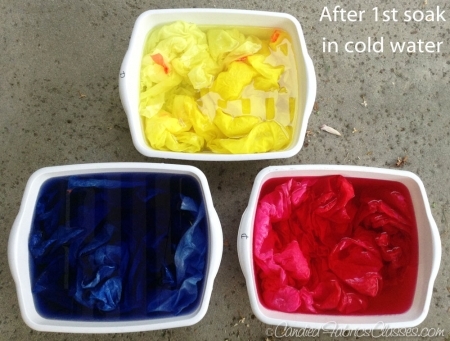 To let the last bits of unreacted dye leave the fabric, let the fabric set in a bucket of water. Repeat this with your other 2 primary colors. After a few hours of sitting in water, wash them (altogether at this point) in the hottest temp your washing machine can do. I use a small amount of Synthrapol, which is a detergent that is sold to help keep any washed away dye particles from depositing on the other fabrics; but if you did that first soak in individual containers, you probably won’t need it and plain old detergent (without bleach!) will be fine. 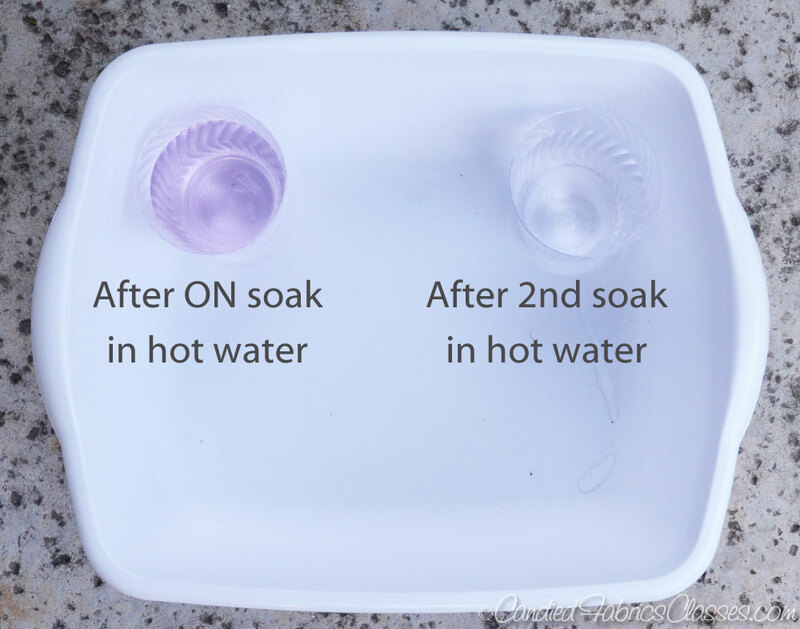 After the washing machine runs all the way through, I usually run it again, stopping it in the middle of the washing agitation, lifting the lid and scooping out some water in a clear glass. If you see no color, your washing days are over – if you do, back to the washing machine for you! 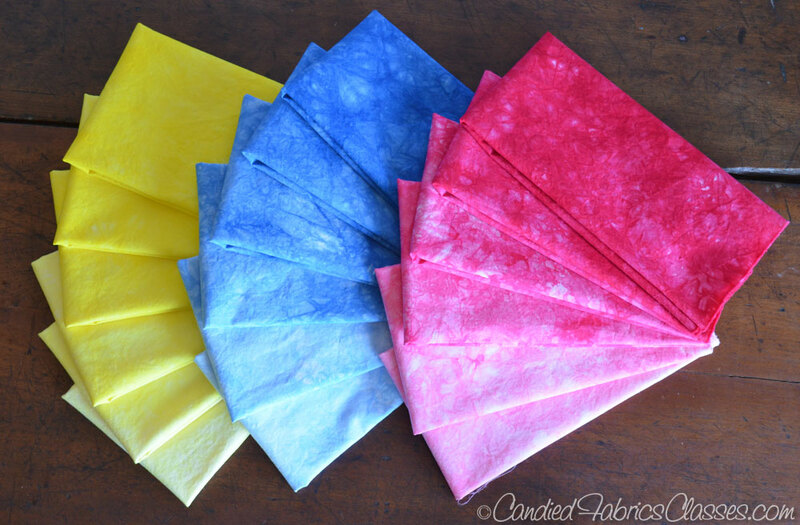 After they’re dry, ironed and folded, rearrange them again and again, because they’re just so much fun to play with! Note: if you are going to leave the Tyvec tags on the fabric, DO NOT iron over the tag! As, there’s nothing prettier than stacks of freshly dyed fabric! There are even more over at the gallery page! Don’t forget to add your swatches to your swatch book! Print a new version of your worksheet onto cardstock and fill in the appropriate spaces. Cut a representative sample out of each piece and use glue, double sticky tape or staples to mount it to the cardstock. Inserting this into a plastic page protector will keep those swatches from being ripped off when you’re using your notebook later on. I think you’ve done a great job presenting information so far. Incorporation of videos makes a huge difference in clarifying processes, such as the way you scrunch your fabric. It will be great when students start putting their fabrics on the gallery. I think there’s always a lot of learning from fellow students. I also appreciate how quickly you’ve responded to comments. I have enjoyed the class and learned so much. I have been dyeing for several years but I find I learn something with every class. The information is so easy to understand. I am looking forward to finishing the table and creating the other lessons and the next class. Candy, you are doing the proper teaching “thing”, having everything shown, told and written. One or the other method should get through to everyone.